Within four months of its launch, Redmi Note series has crossed the 5-million sales mark in India. Xiaomi on Thursday announced that with the new records the Redmi Note 5 series models have become the fastest growing smartphones in India. Redmi Note 5 series was rolled out in the market in February, and since its launch, the smartphones have become the top choice among MI users. Xiaomi’s Redmi Note 5 Series has become the fastest selling phone series in India after it surpassed 5-million mark within four months of its launch. Xiaomi on Thursday claimed that with the new records, the Redmi Note 5 series has taken over all the previous records. In a press statement, the company said that the Redmi Note 5 series, which consists the Redmi Note 5 and Redmi Note 5 Pro, has gained a massive popularity from Mi fans. Redmi Note 5 series was rolled out in the market in February, and since its launch, the smartphones have become the top choice among MI users. The company launched the smartphones to compete with other flagships including Asus ZenFone Max Pro M1, Moto G6, and Oppo Realme 1. The first sale of the Redmi Note 5 series took place a week after it was formally launched. In just three minutes of its sale, the company sold more than 300,000 units of the Redmi Note 5 series models. While Redmi Note 5 Pro was rolled out in the market with a starting price of Rs 13,999, the Redmi Note 5 was available with a price tag of Rs 9,999. The price of the Redmi Note 5 Pro was raised by Rs 1000 following the declination in the value of rupee and PCBA import taxes. Coming to the specifications, Redmi Note 5 series models sports an 18:9 display, a thin bezel, a selfie-light setup and a 4000mAh battery. Both Redmi Note 5 and Redmi Note 5 Pro run on Android Nougat-based MIUI9. Other features include a 5.99-inch full-HD display and both have a dual camera setup wityh a 5-megapixel camera in the front and a 12-megapixel camera at the rear end. 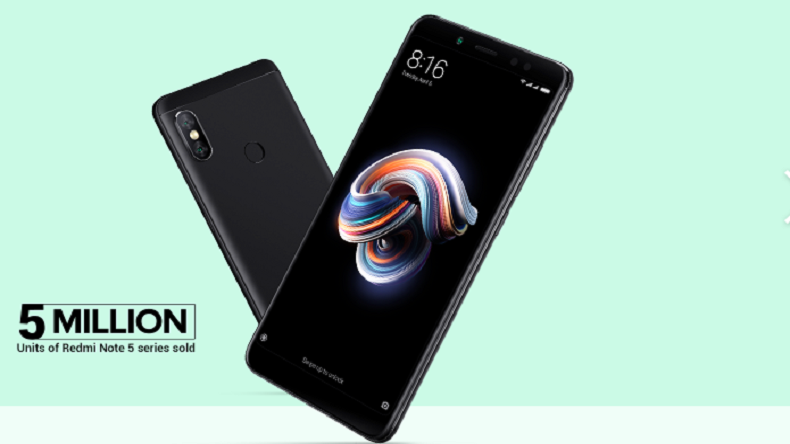 While Redmi Note 5 Pro is available to purchase through flash sales, the Redmi Note 5 can be purchased openly through various online and offline stores.